So starts famed illustrator Howard Pyle’s old fairy tale, “Farmer Griggs's Boggart,” first published in Harpers Young People magazine. San Diego Community Theater's Junior Theatre Wing produced an adaptation by Mary Thurman Pyle as one of two touring community outreach productions in the Summer of 1952. The other was The Princess Who Disappeared, by Geraldine McGaughan. Mrs Richard Billingsley directed her 8 and 9 year-old students from the Summer Drama Workshop, under the supervision of program director Mary Corrigan. Farmer Grigg’s Boggart was performed at 17 city playground areas, with flexible sets transported from venue-to-venue by truck. 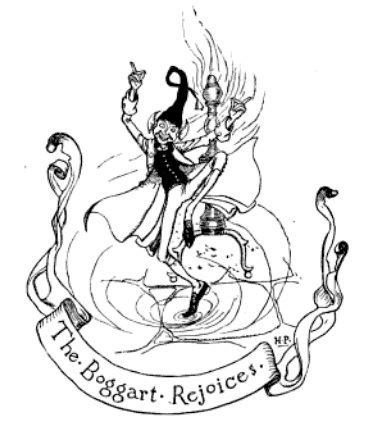 Farmer Grigg’s Boggart, a Play in Two Acts, adapted for the stage by Mary Thurman Pyle, from the childern’s story written and illustrated by Howard Pyle. Presented by special permission from Row-Peterson, Evanston, IL. Production sponsored in part by the San Diego Community Theater, the City of San Diego Park and Recreation Department, and the City of San Diego.